De Jasay locates a fundamental flaw in most justifications of political action. Measures of state intervention (e.g. welfare legislation, redistributive taxation, tariffs) are supported in view of the beneficial consequences they are imagined to have. But many values cannot be compared with one another. “Between the good and the bad consequences, where neither is either greater or smaller than or equal to the other, no balance can be struck, and consequentialist reasoning is simply out of place” (p. 9). In particular, the utilities of different persons are incomparable. This fact will hardly be news to those conversant with economics, but the implications of the point have rarely been pursued with such rigor. Given the inability to compare utilities interpersonally, consequentalist reasoning goes effectively by the board. But what then can replace it? To our author, the collapse of consequentialism “releases and activates the basic presumption against coercion. . . . Accepting, and acting on, this presumption also presupposes a value judgment, but it is one that demands far less of our moral credulity than any consequentialist alternative I can think of” (p. 12). With his liking for simplicity, our author’s verdict on Robert Nozick’s “solemn symbolism” justification for politics can readily be predicted. Nozick, author of the libertarian classic Anarchy, State, and Utopia (1974) stunned readers of The Examined Life (1989) by a sharp change of opinion. Previously, Nozick had opposed the welfare state: compulsory taxation to benefit the poor, he held, is a type of forced labor. In his new book, Nozick shifted completely. By compulsory provision of welfare, a society could express its “symbolic commitment” to the value of aid to the less fortunate. True enough, taxation for welfare violates property rights. But those unwilling to contribute, were they allowed freely to abstain, would prevent society from symbolizing, as a united body, its commitment to the poor. Property rights, to Nozick, cease to be absolute; their value must be balanced against the competing value of symbolic expression. De Jasay’s opinion of the new departure is less than enthusiastic: “Even if all this is meant seriously . . . it does not amount to much of a ground for putting welfare on an involuntary basis, especially as Nozick is prepared to concede that just as much and as good may be accomplished voluntarily . . . The single voice rarely sounds and the uniform conduct rarely comes about by itself” (p. 60). De Jasay’s objection, then, is that the unity Nozick advocates ought not to be valued at all: what good is it for society to speak, by means of coercion, with a “single voice”? Is de Jasay right to reject Nozick’s view in so uncompromising a way? Certainly Nozick’s concept opens the door to danger. Why could not a communist regime “justify” itself by claiming that dissent threatened the unified expression of commitment to communism? What is so special about symbolic commitment to welfare? Clearly Nozick owes us an account of the conditions under which symbolic commitment overrides classical liberal rights. And why cannot a classical liberal society claim that the absence in it of compulsory taxation symbolizes its commitment to freedom? Again and again, de Jasay has illuminating things to say about important issues, e.g., the fallacies of Bruce Ackerman’s “neutral dialogue” (pp. 62 65); and the justification for the initial acquisition of property (pp. 42 ff). 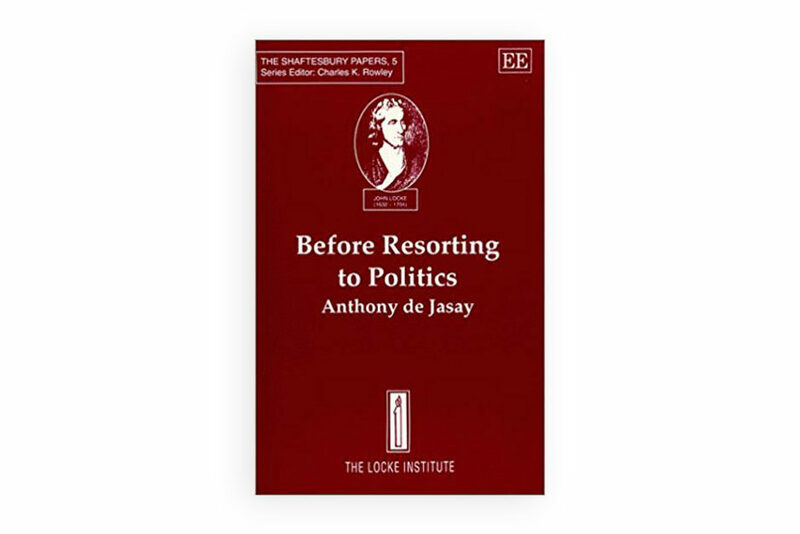 On only one point do I think that de Jasay’s views require modification. He defines coercion as “an intentional act by A, whether actual or threatened, whose effect is so to change B’s set of feasible alternatives as to make his chosen alternative different from what A presumed B’s alternative to be. Successful coercion must make B act otherwise than A thought he had intended to act” (p. 26). This definition appears open to counterexamples. Suppose that I think, correctly, that you are about to exit the room. I like using force, so I twist your arm and push you out. Have I not coerced you, even though I did not make your chosen alternative different? You would have departed anyway, and I knew this. And suppose I offer to buy something from you. If I think you otherwise would not give me the item, does my successful bid coerce you? The definition seems to require that it does. Fortunately, this problem does not affect the substance of de Jasay’s argument. The author’s remarkable ability to clarify basic issues arouses my admiration and (I regret to say) jealousy.